Loved StayOkay! It is a great location and for the cost it was a great place, I was blown away. If you are a single woman travelling, however, be careful in Vondelpark at night. I recommend taking the road leading to the hostel and not going through the park at night. We loved this hostel! I stayed with my wife and 4 children (aged 12, 11, 5 & 6) in a private 6 bedded room( 3 x bunk beds) with en suite facilities and it was great. 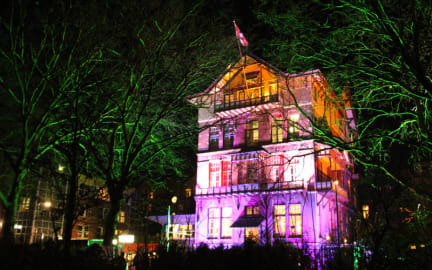 The location is brilliant with the Vondelpark literally on the doorstep and the Rijksmuseum, Van Gogh Museum, Concertgebouw, Stedelijk modern art museum, Leidseplein all a short 10min walk away. The room was basic but fine. The communal areas are chic and inviting. Breakfast was great too. All in all a great experience. Thank you! Really enjoyed my stay here. 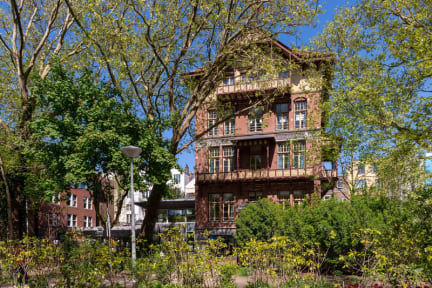 It's just outside the main areas of the city and is in a beautiful location right next to Vondelpark. It's a pretty easy walk to city center and is far enough to be very quiet and peaceful at night. The staff were very helpful and I had no real issues besides snoring roommates (but that's hosetl life). It was a bit expensive, but compared to the rest of Amsterdam, was decent value. Overall a fantastic hostel, with a brilliant atmosphere. Could do with a kettle or something in the room, or perhaps a communal microwave. Sometimes waited a while to get served at the bar even though there were staff doing nothing behind it. But staff generally were very friendly and had a good sense of humour. Super great location and nice place to stay. Overall very clean. Had comfortable beds and nice showers. The hostel is really nice. The staff was really cool. It’s not so close to some parts of the city, but if you get a train or walk for 20/30 min you can get to the some places. I got a really good room, with nice people. I really loved the experience. This hostel is HUGE. Consists of 3buildings so you will need to queue whenever you need assistance from receptionists (Blame it on management). Showers and toilets clean and well maintained but because of bad design, shower gets very dirty very easily. Breakfast is the worst paid breakfast I have ever seen and even the poor choice on buffet was never refilled, so save your euros and go for a generous continental breakfast at the nearby satelite bar for almost the same price. Elevator too slow. The hostel is generally very nice. It has a modern communal area with bar and area to socialise, which was ideal for our large group of people. The staff were very helpful and accommodating, and made life easy for us to pay baring in mind we had 10 guests between 2 rooms. The rooms themselves are basic, bunk beds, toilet, shower and facility to lock your belongings provided you bring a padlock. The room is a bit out dated, but all in all would highly recommended. The hostal have policies that doesn’t look for a customer satisfaction, and are more like: “let’s save and make money on every chance”. Showers are annoying, you have to push a button every 15 seconds. Doors from streets are open from reception, and reception is not available 24 hours. You have to specify your check-in time. If you are 1 hour late, you can lose your booking and have to pay a 5€ fee. The problem is your policies, fix them.